I’ve been getting into Dark Souls lately. I’ve been playing the Prepare to Die Edition of the first one by myself, and have been playing Dark Souls III with my bro-in-law. Both are excellent. Both are huge. Both are really hard. What initially made me realise the difficulty of these games was actually coming back to Skyrim after playing Bloodborne which, let’s face it, is basically a Dark Souls game. After having difficulty battling mid-range monsters in Bloodborne, returning to Skyrim and accidentally becoming arch-mage of the Mages’ Guild really highlighted the differences between the difficulty gradients. It seems to me sometimes that Skyrim is so easy that it’s basically about collecting sweet loots. But Dark Souls is so hard that it rewards learning, and that’s really not something you can say about a game very often. The game rewards noticing the patterns that enemies take, and is brutal in its punishment when you don’t. 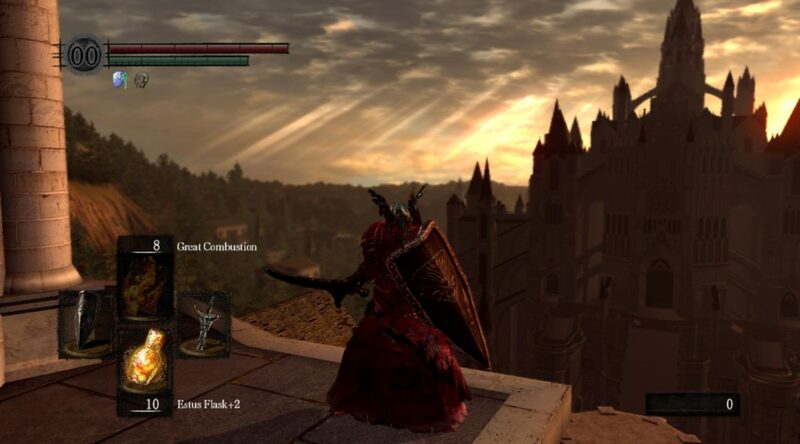 And although I get really frustrated with having to re-play so much after dying so often, I do also really appreciate how much Dark Souls makes you work for your progress. The one thing I don’t particularly enjoy is how far it is (geographically) between bonfires and boss fights. I don’t find it enjoyable having to fight my way back through 5+ minutes of enemies only to encounter certain death, 10+ times in a row. Grinding is one thing, but this isn’t grinding, it’s just walking. I’m sure there’s a good reason for it somewhere, and I deal with it just fine, it’s just not my preference in a game activity. I find the use of music in Dark Souls interesting. My best guess at the moment (and I think I’m well under half way through) is that music is used a. at the Firelink Shrine, and b. at a place where you can join a covenant (which also includes the Firelink Shrine atm). But I’m far from sold on this theory. The Ash Lake area is one of these — the first in-game area I’d heard music after Firelink Shrine, and such grand music at that — and it’s huge compared to where you meet Quelaag’s Sister. I also like that when you’re entering Ash Lake the music only begins intermittently, when you’re looking directly at one of the shafts of light descending from the “sky”, and then when you’re on the beach the music becomes constant. Oh! and also, music is used c. in boss fights. I realised this halfway through fighting Executioner Smough, several tens of hours into Dark Souls. After taking out Ornstein you can keep Smough behind a pillar to avoid damage and just take a swing every so often. This takes a while to get through, and I think eventually I calmed down to a point where the link between gameplay tension and musical tension broke. Which made me realise how much music I hadn’t been noticing. And that makes me think that the music for these boss fights must be near perfectly matched to the action. Very cool. I also noticed that, while fighting Lautrec of Carim, that there’s another layer of ambient sound added in a musical sort of way (i.e. non-diegetic) — a very atmospheric kind of sound. Now, I’m a fellow who likes his single player games quite single-player-y, so I haven’t invaded any other players’ worlds, and I can’t rule out that this sound might just be the “you’re a phantom now” aural cue. I don’t know. But I’ll find out, because I’m planning a thesis chapter on exactly this kind of use of ambient sound. Also, I really like that these games have such beautiful worlds. For a games with such dark themes they use light, space and colour very well. And grumble grumble falling off things but it is pretty amazing to have such a masterful use of vertical space in 3D video games. Between the amazing worlds and the amazing challenge these games present, it’s easy to get lost in them. So far, I’m enjoying this a lot more than I thought I would. Somewhat miraculously, I’ve also been getting a lot of thesis work done lately. The end appears both in sight and achievable, and that’s fantastic. There’s still a long way to go, but I’m liking how it’s coming together, and I’m starting to believe that it might actually be a worthwhile piece of research.